The Springfield XD Mod 2 is all about the ergonomics. It has some other updated features as well, but the shape and feel of this pistol tells you right away what its purpose is: smooth self defense operations and a comfortable hold during any shooting. We, more or less, stayed away from the grip in this review for the best Springfield XD Mod 2 accessories, and we focused on the other features that could use an additional upgrade. The most important thing to pay attention to when shopping for Mod 2 accessories is to scan the seller’s page because the Mod 2 comes in a variety of models and sizes. You will quickly learn that not every accessory is built to accommodate every model. With that in mind, we did a lot of that dirty work for you, and we’ll let you know which accessory was our favorite for this handgun. Materials – The grip extensions from Pearce Grips are constructed from high impact polymer, designed to stand up against extreme temperatures and resist cracking or breaking when dropped. 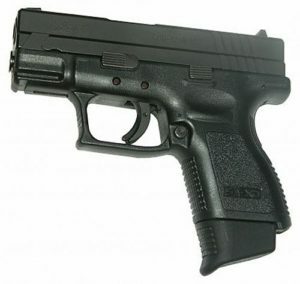 The grip can accommodate the 9mm and .40 models of the XD Mod 2, but it will not fit the .45 ACP models, unfortunately. By extending the shorter grip on your Mod 2, you will have more control and better comfort in your hand while firing. By being designed specifically for the Springfield XD series, the overall appearance and contours of your handgun will be streamlined. This will be optimal for concealed carry as well as maintaining a discrete overall profile. 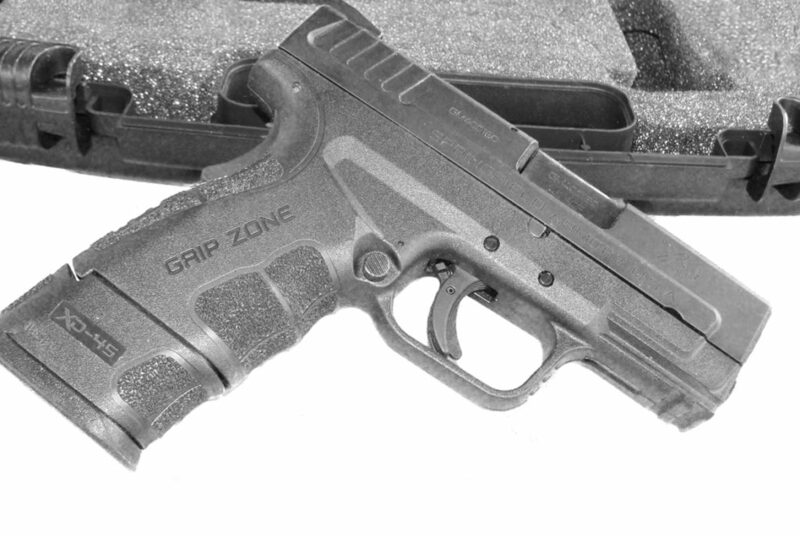 Performance – You may like the lightweight and small size of a sub-compact handgun, but that doesn’t necessarily mean the grip fits properly in your hand. With a grip extender, you can ensure that you can easily grab your XD Mod 2 from its holster without fumbling around. Obviously, your shooting accuracy will be enhanced as well. This handgun’s original grip is already very ergonomic, so the grip extension will streamline the whole design. Although Pearce Grips pretty much has the market in a monopoly for grip extensions, they won’t fit every model of the XD Mod 2, so make sure you pay attention to the selling page. A word of advice, anyways: try to stick to the 9mm and .40 models; you’ll have better luck with finding accessories at all. What we say – The Pearce Grip extensions are the best XD Mod 2 accessory for those who have the sub-compact model, but they still need the grip to fit in their larger hands. This is also the cheapest accessory to choose from within this review. Materials – DefendTek’s tactical flashlight is a 300 lumen beam of light that is housed within an aircraft grade aluminum body. It has been sealed to be resistant to dust and moisture. You can easily install the flashlight on your XD Mod 2’s accessory rail, and it uninstalls quickly by using the quick detach levers. A recoil resist bolt will keep this accessory well in place. You can switch between two flashlight modes: constant on or strobing. Included with the package is a rechargeable battery and a battery charger, so you never have to carry along replacement batteries or worry about running out of power. This option is not compatible with subcompact model pistols, but it will accommodate the service and full size models. Performance – If you happen to use your Springfield XD Mod 2 for more tactical purposes, an LED flashlight will be the best accessory for you. Of course, the flashlight can be used in self defense as well, but it won’t fit the sub-compact models. If you use the full sized model for you conceal carry, then more power to you! The quick detach levers on this flashlight are a dream, and 300 lumens of light is a very decent power for a small, tactical flashlight. No tactical light is worth it without a strobing mode, so that’s a “thumbs up” in our book as well. This little guy is pretty shock resistant, so expect it to last you for a while. What we say – The tactical flashlight from DefendTek is one of the best XD Mod 2 accessories for anyone with the four inch or five inch handguns. Tactical or self defense, you’re in good hands with this light. VERSATILE MODES - Featuring two versatile settings-steady and strobe-each mounted light easily switches between pinpointing or disorienting your focused target. 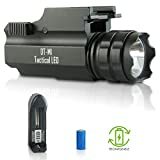 MULTIPURPOSE DESIGN - Compact, lightweight and featuring a quick-release mount feature and tactical bezel, it's a perfect tactical light for, security, or bodyguards. 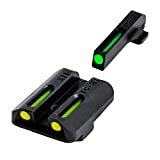 Materials – This pair of night sights from Truglo are a great XD Mod 2 upgrade to replace the original red fiber optic sight included on your pistol. The set includes a front and rear sight. 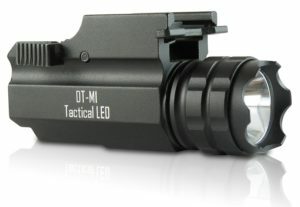 Housed within the sights are three Swiss tritium inserts: two in the rear and one in the front. The front tritium insert glows a bright green color for easy target acquisition. The rear sight houses two yellow tritium inserts, which contrast with the front insert for fast targeting. The yellow is also intended to be easier on the eyes, so the shooter isn’t hurting their vision at night. The rear sight is in a classic U-notch shape, and both sights are low profile to accommodate XD Mod 2 holsters. Performance – To be perfectly fair, the Springfield XD Mod 2 pistols do come with a fiber optic sight installed. We are not knocking what is already there, but tritium night sights will take your defense to the next level. 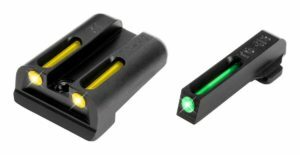 Fiber optics aren’t incredibly visible at night, but the contrasting yellow and green dots in these sights will allow you to quickly lock onto your target in any lighting situation. We really like the thoughtfulness of using yellow inserts in the rear sight. This way, particularly at night, you won’t have brightly glowing dots right at your eyes, making you squint. Unfortunately, there are no painted rings around the inserts, but you can always pick up a cheap bottle of photo luminescent paint and add them on yourself. What we say – The Truglo night sights are one of the best XD Mod 2 upgrades for those who think the original fiber optic sight just doesn’t cut it. Acquire your target with no problem during both day and night. 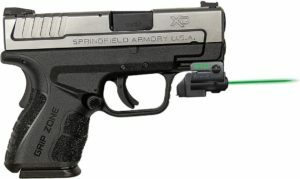 Materials – This green laser from ArmaLaser can accommodate all models of the Springfield XD Mod 2 line. Simply attach it to the accessory rail! The U.S.A. made laser is housed within DuPont Zytel polymer, which is used in pistol construction. The laser’s housing is durable and resistant to shock, dirt, and moisture. The activate, simply grip your pistol as you normally would – there are no switches, buttons, and holster activation involved. The green laser emits 520nm of power, which will be visible best during the day time. Although it is not the most powerful laser on the market, it is very bright and just under the maximum output allowed for civilian use. Performance – Take your tactical operations or your home defense to the next level with a laser. We personally believe that the ArmaLaser brand goes highly undervalued because they offer some very quality accessories. Although this green laser is activated by touch, there are no switches or pads to worry about pressing. This is as close as you can get to instant-on lasers without shelling out the extra money and being stuck with a holster you may not like. It’s not a Class III laser, but, again, it’s about as close as you can get to one without paying the extra money for it. This is probably one of the best bargains you can find in a pistol accessory. What we say – The ArmaLaser Mod 2 Green Laser is the best accessory for anyone who needs the additional targeting power during daylight. It is visible at night, but green lasers are best for using in lit areas. Extremely bright 520nm Green Laser with grip activation. Just grasp pistol normally to turn laser on. Custom fit FLX54 ultra thin remote touch sensor switch for Springfield XD Mod 2. included. 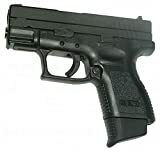 Uses human touch technology to turn on, no mechanical switch or push button or holster activation. Our favorite accessory in this review was the DefendTek Rechargeable Tactical LED Gun Flashlight. For one, this is one of the most useful accessories you can attach to your Springfield XD Mod 2. It’s easy to install, and it’s not very expensive either. Even if it doesn’t fit your conceal carry sub-compact, it will fit the full sized models, which can still be used for home defense. While it’s entirely perfect for the XD Mod 2, you can always detach and install the flashlight on any other handgun with an accessory rail too. With a 300 lumen light power, and two light modes, you can feel safe and in charge with this flashlight from DefendTek.